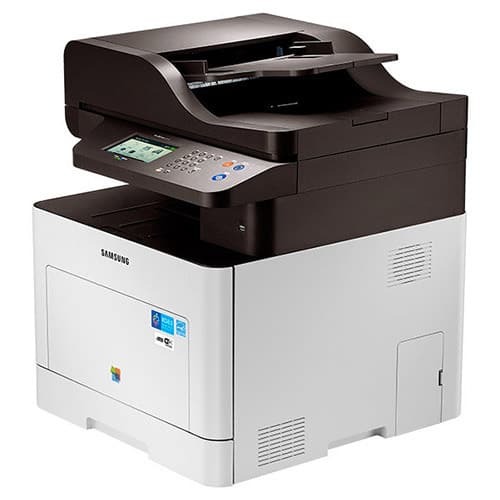 Samsung C2670FW Color Laser ProXpress - Perfecta Business Services, Inc.
Samsung’s Rendering Engine for Clean Page (ReCP) technology, up to 9,600 x 600 dpi effective output and our polymerized toner improve the overall quality and vibrancy of your color printing. Graphics and text are brought into sharper focus, while solid objects are overlapped to eliminate white gaps. Achieve print speeds of up to 27 pages per minute (ppm). The 533 MHz dual-core processor, combined with 512 MB standard memory (expandable up to 1 GB), reduces completion time for even the heaviest print and copy jobs. So your business can speed up document processing to drive efficiency. The printers’ multipurpose tray supports media of up to 220 gsm (grams per square meter) in weight, offering more printing choices. Numerous labels, cards and envelopes can be printed using the multipurpose tray, virtually eliminating the time it takes to feed sheets one at a time. The Samsung Mobile Print App allows you to print from your mobile device with useful features, including N-up printing, image size adjustment, visual troubleshooting and support for mobile scan and mobile fax. With Samsung NFC Print™, workers can simply tap, print and go with the Mobile Print App. Print directly from your NFC enabled mobile device via the Samsung Mobile Print App. Features of the App include advanced print functions, supplies monitoring, error troubleshooting with visual aids, scan and fax. With the one-touch Eco button and the smart Eco Driver, it’s easy to cut costs. Print more on each page with N-up and duplex functionality, change to Toner Save mode, skip blank pages or print in greyscale. With the Results Simulator you can even see how much CO2, power and paper you’ve saved.